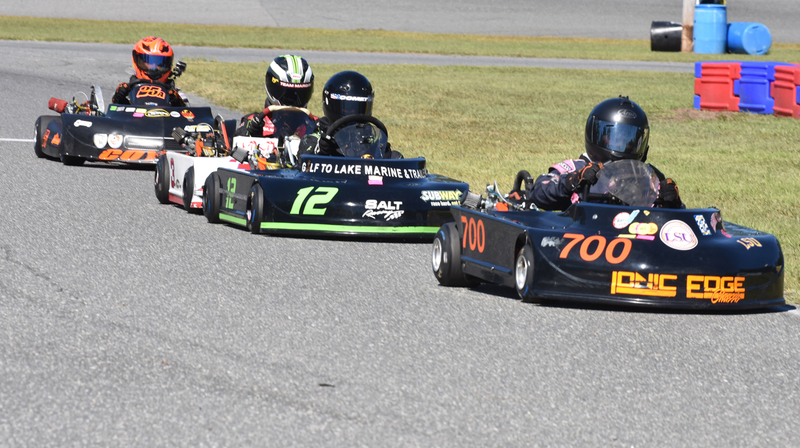 Luttrell Racing and the IONIC Edge Chassis team enjoyed a great amount of success this past weekend Oct. 21-23 at the 103rd Street Sports Complex in Jacksonville, FL – site of the first-ever AKRA American Sprint Cup Grand Nationals. Utilizing the Vega Blue tire for the first time at the high-speed 103rd Street course, Evan Cowen, Macon Moore, Camryn Reed, Elijah Skaggs and his father, Joseph Skaggs, drove IONIC Edge chassis in the competitive Grand National event. Louisiana’s Macon Moore would dominate the 206 Junior class that saw five entries on the weekend. Racing against some strong competition from several Florida drivers in attendance, Macon won every round of competition on the weekend including two Pole Awards, a pair of heat race wins and triumphs in both 14-lap features. 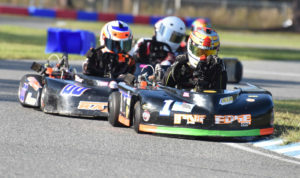 Moore’s success would net him the overall weekend Grand National championship to cap a strong season in the AKRA tour for the 12-year-old racer. Elijah Skaggs and Camryn Reed drove their No. 1 and No. 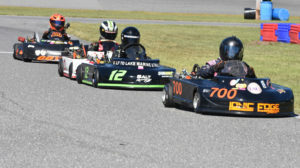 709 IONIC Edge karts in the hotly contested 206 Cadet division that had six of the fastest Cadet LO206 racers in the Southeast competing. On Saturday Elijah paced the field in qualifying with a fast lap of 41.245 to win the Pole Award. Camryn would qualify P2, just 0.123 seconds off of Skaggs’ time. Elijah would win the 10-lap heat race while Camryn finished P3. Skaggs led nearly every lap of the feature but would get passed on the final lap to settle for the 2nd-place finish, while Camryn would finish a strong P3 for her best finish of the season in the AKRA series. Sunday’s 206 Cadet races saw Skaggs finish P2 in both qualifying and the heat race to set up a showdown with Tanner Carter in the main event. Elijah would follow Carter for the entire race and this time wait until the final straightaway to make his move past Carter and race to the win and Grand National championship victory for best overall finish on the weekend. 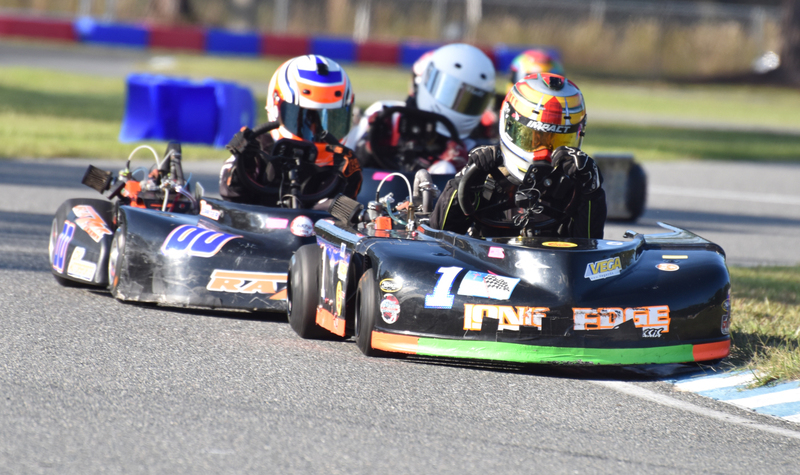 Elijah’s Sunday feature win combined with his P2 finish Saturday would give him the 2016 AKRA national championship in the 206 Cadet class. Camryn would finish P4 in Sunday’s feature. She also raced an IONIC Edge CIK kart in the TaG Cadet Restricted division. Evan Cowen and Joseph Skaggs entered their IONIC Edge’s in the 206 Senior Heavy division. Cowen would finish P5 in Saturday’s main with Skaggs crossing the stripe just behind in P6. Sunday’s 206 Heavy main would see Cowen get involved in a first-turn accident when the field bunched up on the start. He’d unfortunately have to sit out the race on the sidelines. Skaggs would drive his No. 7 to another P6 finish after a strong 4th-place qualifying effort earlier in the day. Joseph would finish P5 overall for the weekend and second to Colin Warren in the 206 Senior Heavy national championship race.